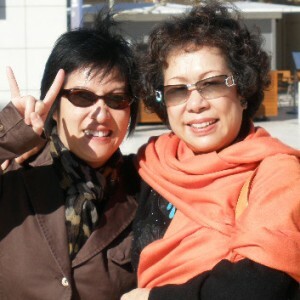 A Mother’s Day Post: Culinary Adventures with Mom « Asian Culture Goes Pop! I had dinner with some friends the other night. One of them noticed my love for food. I am often asked, “Are you a cook?”, or ,”Where did you learn to love food in such a way?” The answer is: my Mom. My mother loved to cook. She had cooking down to a science. She is forever fussing over which type of wok has the best circulation of heat, which spice to use, etc. My family is not rich. Both of my parents worked damn hard to send me to college, keep the family sane and have a roof above our heads. We could not afford to go on vacation every summer like many families do. Most of my friends at school went to summer camps, I helped out at the law office my mother worked at, doing clerical work and standing in line at court houses filing papers. My mom compensated vacation time with culinary adventures. Whenever it’s time for lunch, she would say, “Today I will introduce you to Greek food, Korean Bugolgi, or French culinary fare.” This may not be a big deal to most people, but it was an eye opener to other cultures for me. Her motto is, “Try it! See if you like it. If not, it’s fine.” Well, that became my motto for life. I would try one dish from a particular cuisine and I then dive in to see what other dishes the cuisine has to offer. This extended into meals at home as well. My mom would go mad once she had discovered a recipe. My father and I are willing guinea pigs. She had made variations of Vichyssoise or Paella. Her version of Paella used Chinese sausages instead of Chorizos and she added Chinese sticky rice to the mixture of saffron rice. Here are some of the places my mother introduced me to. Kansuh Restaurant (Korean), Le Bonne Soupe (French), Hatsuhana (Japanese), Congee Village (Cantonese Style Rice Porridge) and Churrascaria Plataforma (Brazilian BBQ). I wish everyone in this world have a mother like mine.